Avengers: Endgame just knocked everyone off their seats with an eerie Super Bowl spot with plenty of post-apocalyptic dystopian vibes. Normally a spot doesn’t warrant a breakdown but this is Avengers: Endgame we’re talking about. Plus, every single scene from this 30-second long trailer spot was a new one, not seen in the Avengers: Endgame teaser released in December. Without further ado then, let’s go about poring over this spot scene by scene. The spot begins by showing us the casualties of Thanos’ snap. We see flashes of dead Avengers through scenes in previous movies, with Hope Van Dyne, Nick Fury, Spider-Man, Doctor Strange, Sam Wilson a.k.a. Falcon, Guardians, Black Panther, Bucky Barnes, Wanda Maximoff a.k.a. Scarlett Witch and Vision. What’s interesting here is that all shots are in black and white, except for the color red which stands out in each scene. Red is also the color of the Reality Stone and it’s perhaps a subtle way of saying these Avengers are now in another reality altogether. A parallel reality or a multiverse perhaps? Also, the order in which the Avengers appear is the reverse of the order in which we lost them, further signifying the inevitable reversal of the snap. Easily my favorite part of the trailer. We see the aftermath of The Decimation as the world is in chaos and disarray. Empty boats float around New York City harbors, stadiums and city lanes are devoid of people and there’s a sense of complete devastation that’s conveyed at the scale of a disaster movie. The scenes also have the bleak bluish color grading that is most often associated with apocalypse sequences. At this point, Marvel has setup a brilliant premise to make a One-Shot movie out of. The snap would’ve not only lost us half the population, but several more as a consequence; for instance, a pilot disintegrating would lead to a plane crash. The Decimation would make for some great marketing material in selling the notion of a post-apocalyptic world even further. The Russo brothers are not stopping at showing world destruction. We see the world mourn the Avengers and a distraught Steve Rogers attending rehab, trying hard to control his anger. It’s possible someone is lashing out at the Avengers for not being able to stop the snap in time, while also berating them over getting out of the snap unscathed. Having seen first hand how close they were to avoiding it, Rogers is visibly upset. He himself tried hard to remove the gauntlet out of Thanos’ hand during the final moments of Infinity War but failed. Later on, we see an equally distraught Thor, still unable to get over the fact that he nearly had Thanos had he gone for the head. The rehab shots remind me of Curt’s rehab center in Marvel’s The Punisher which is a minefield for great storytelling. Looks like Tony Stark isn’t giving up so easily. After appearing helpless in the first Avengers: Endgame trailer, Stark is back to Mark I mode, rebuilding parts of the ship to get them back to earth. And Nebula is there assisting him too, taking Yinsen’s place in what is undoubtedly a cool callback to 2008’s Iron Man. And to think I even started off the Road to Avengers: Endgame series with Iron Man first. The feels. The first trailer had hints of time travel in the final scene when Scott Lang appeared in front of a monitor via “archive footage”. We see a scene with Cap and Widow straight out of their outfits in that very scene, headed out looking at the sky at something. Judging by the different angles each is looking at, they could be staring at something big, which probably suggests Stark’s Benatar has made it back to earth. It’s either that or one of Captain Marvel and Thor returning back. Cap is wearing the exact same T-Shirt he was in the final scene of the teaser. Widow and Banner are also in similar clothing. Moreover, Scarlett Johansson has two different hairstyles in the trailer, suggesting either the passage of time (perhaps a few months) or a potential misdirect. Rocket & Thor On Another Planet? Rocket and Thor seem like they’re on a different planet or place altogether. It could be Wakanda, it could be Thanos’ farm, it could be something else entirely. Whatever it is, it looks far removed from the footage in the rest of the trailer showcasing a bleak NYC making it highly unlikely that it’s earth. There’s also a mystery figure who appears at the 20th second mark. People online believe it’s Thor with his Stormbreaker but that umbrella-shaped item on his hand make me doubt those claims. This looks like some other figure entirely, even if it has a cape similar to Thor’s. One of the Eternals perhaps? Black Widow is seen target practicing with a pistol. Make fun of her all you will but she’s trying to aim for the head, so that she doesn’t miss a shot if she has one. Also, her hairstyle is a ponytail, different from the cut in the scenes before, indicating either the passage of time, or a different reality altogether. 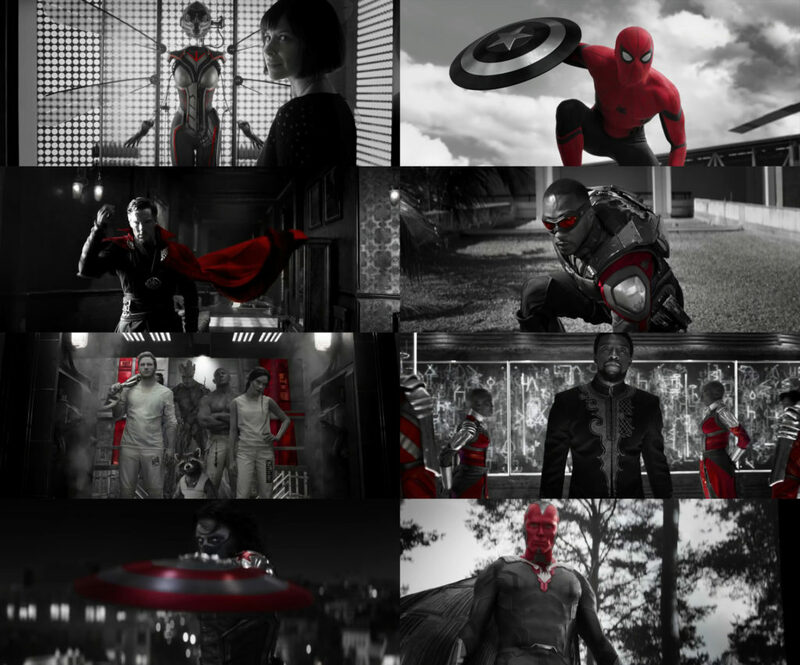 In the trailer’s opening, we saw the dusted Avengers in Red. I surmised that the red is meant to signify an alternate reality. In the present-day, only one Avenger is seen in Red that is Hawkeye. Now this could either be metaphorical, in that Hawkeye has entered a different reality as Ronin or literal, as in that Hawkeye shot is actually from a parallel reality. I do believe it’s the former though and the red tones are quite similar to his shot from Hong Kong in the first teaser where he’s hunting down the Yakuza. The shot that gave me the most chills, Captain America tightens his grip on a shield with shaking, trembling hands. It’s highly unlike Cap to be nervous so this is most certainly his preparation for a final stand with the Mad Titan Thanos. His hands are also dirty and soiled, indicating a fight has already taken place before this scene. The setup here also looks similar to the scene when Cap and Black Widow console themselves in the final teaser shot before the title reveal. It’s possible then, Rogers is actually prepping himself to travel back in time, resulting in the much obvious nervousness. At last, we get a more subdued version of an Avengers shot, showing everyone together. We see Cap leading the way, followed by Thor, Widow, Rocket, Lang and Rhodes. Between Lang and Rhodes though, there’s space for one more person who looks like he / she has been edited out. Start your guesses on who it could be. That’s it folks. That’s my breakdown of the Avengers: Endgame Superbowl spot. Let me know what you think of this in the comments below.